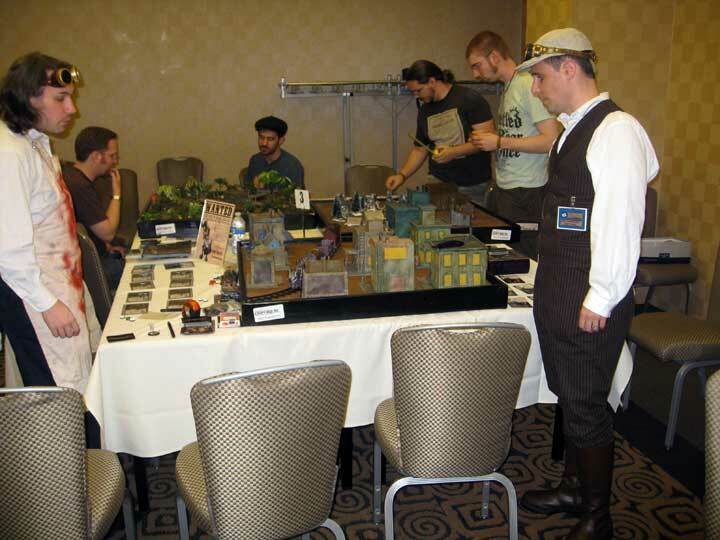 Memorial Day weekend I had the pleasure of running Malifaux demos both Saturday and Sunday. The event was lots of fun with plenty to see and do. There were several bands that I wasn't familiar with prior to the con, but they seemed pretty good for niche steampunk themed music. The costumes were pretty amazing and I'm sorry to say I forgot my camera when I was walking around the con so I don't have more pictures to share of the rest of the areas. The vendor room was packed with interesting things. Lots of costumes and accessories, (gears, goggles, fancy hats and what not) I broke down and bought a top hat. However I refuse to pay for "welder's goggles" that have been modified. I'm going to make a pair of my own since the materials are incredibly cheap and I want mine to be Malifaux-themed. Demos went amazingly well, I started 2 hours early on Saturday because the table was ready. As soon as I set up my demo tables and other gear, numerous people flocked to the tables to ask questions and learn more. Around 5 when the demos were scheduled to start we had a sudden influx of people, with numerous quick demos of the mechanics and an explanation of the game. Well over half of the people that received the "quick demo" came back later to either participate or watch a full game. Sunday we went none stop from the time the room opened until it closed at 11:00pm. Luckily I had two guys there to help out. Both Trevor and Alan were super energetic and played tons of full demo games. Boiling the game down to a simple game of war with a twist was the easiest way I found to explain the mechanics to non-gamers (which we a had a ton of). It's an easy sell for people who have played Warhammer, Warmachine or another miniatures game in the past. 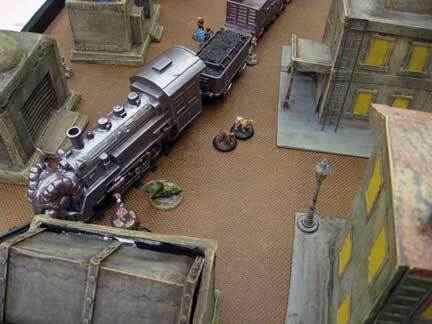 Most of them loved the easy buy-in for a skirmish style game and thought the rules were a breath of fresh air. Special thanks is in order for both RIW and Pandemonium (game stores in the area). Both stores provided coupons and information for their upcoming leagues. I'm hoping to see lots of new faces at both locations. In other news, Pandemonium is starting their "Faction Wars" league Monday June 14th. Check the Wyrd forums for more info. And RIW has their Tuesday Tussels every Tuesday night (Malifaux has significantly out numbered the Warmachine players every week...No hate though). If you live in the Metro Detroit Area you should definately try to make it out to either location.